Moneymax® 401(k) is specifically designed to give you a competitive working advantage. 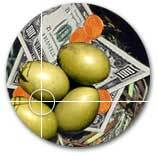 You will gain enormous insight into the individual money personalities of Plan Participants. You will learn how they deal with money, save it, spend it, invest it and value it. Moneymax 401(k) will disclose their risk-taking threshold, their involvement level and their emotional perspective among many other important and significant money management traits. The reporting functions allow you to compile all this data, in presentable graphic form, giving you an overall picture of your Plan Participants as a group and their group thinking. Knowing all this information will give you a solid foundation for developing a 401(k) program that will make the Plan Participants feel comfortable, even enthusiastic about their participation and opportunities for growth. The result will be greater involvement, more Plan enrollees, larger contributions and unparalleled success. You will be recognized as a 401(k) authority. In addition, you will shine in the eyes of your 401(k) Plan Sponsor. After all, you will be guiding the company toward its financial goals while protecting them from unwarranted legal actions because the plan was not performing up to standards. And you will bring a degree of excitement and enthusiasm to Plan participants that will encourage their full participation. This is exactly what your company and Plan Sponsor is looking for. And this is exactly what Moneymax® 401(k) will help you deliver. Moneymax 401k includes: questionnaires (online and/or paper); advisor management page and reports; personalized participant reports. Cost: Quantity pricing from $4.95 to $6.95 See Order Form For Price Breakdown.